In 2016, the Company acquired an option to earn an undivided 50% interest in the Monroe project located 20km south of Cranbrook, British Columbia. 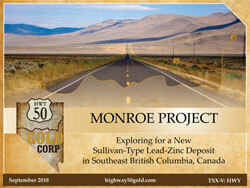 The Monroe claims are centred over the Southern extension of the Sullivan Mine Corridor which hosts the world class Sullivan lead zinc mine, located 40 kilometres to the north. The Sullivan Mine is located at the top of the Lower Aldridge Formation where the Sullivan Corridor links to a basin transform fault feature known as the Kimberly Fault. At Monroe, the Sullivan Corridor is linked to the Moyie Fault forming a mirror image of the Sullivan structural linkage. Within the Sullivan Corridor, several mud volcano vent fields are present, and are important as fluid upflow regions within the sedimentary pile. These upflow areas also channelled ore-stage fluids which formed the Sullivan and North Star-Stemwinder Pb-Zn-Ag deposits. A similar aged mud volcano field has been enountered at Monroe. In 1966, mineralized float of disseminated lead-zinc was discovered west of Monroe Lake by Helge Fors and Dave Pighin. Subsequently, the source was found in outcrop, prompting Cominco to acquire an option on the property and execute shallow drilling. At this time, the stratigraphic position of the Fors mineralization was unknown other than it was suspected that it was low in the Middle Aldridge because of outcropping Lower Aldridge nearby. It wasn't until 1967 that stratigraphic varved marker sequences in the Middle Aldridge were correlated, providing a stratigraphic column in the 2,700 metres of monotonous sediments overlying the Sullivan orebody. In 1979, the breakthrough Vine discovery was made. Dave Pighin, then a Cominco geologist, discovered massive boulders of pyrrhotite-galena-sphalerite in a recent road cut 4km east of the Fors. Trenching showed the source of the boulders to be a large massive sulphide vein near Sullivan Time and was the impetus for extensive testing for stratiform lead-zinc in the vicinity by Cominco. During 1992 to 1993, Barkhor Resources and Consolidated Ramrod discovered the Fors Vent System (Pb-Zn-Ag), a small stratiform deposit of 75,000 tonnes with an underlying feeder vein system and tourmalinite alteration. This deposit is located at the Hiwatha marker, 480 metres above the Sullivan Time Horizon. The discovery sparked another round of deep drilling; 30+ holes to the Sullivan Time Horizon, mostly east of the Fors and west of Monroe Lake. In 1996, Citation Resources, managed by the Leask brothers, acquired an option to earn an interest in the Fors property and tested under the Gabbro Arch to the west of the Fors Vent with several deep drillholes to 1,219 metres. A total of fifteen holes were drilled in this campaign. This was management's first involvement in the project area. In 2010, an area east of the Fors was acquired by the Leask brothers, and several drill holes were relogged west of Monroe Lake, leading to the hypothesis of a sub-basin forming a separate and untested domain east of previous drilling. In 2016, the Company drilled holes HWY16-01 and HWY16-02, confirming a mineralizing system in this area. Follow-up drilling in April 2017 of hole HWY 17-03 confirmed the sub-basin and documented the Sullivan hanging wall section with attendant albite alteration, intense sericite alteration and Pb-Zn in disseminations and tension cracks at the bottom of the hole. To date, drilling has encountered similar geologic units found within the Sullivan Corridor, including sulphide layers, albite fragmentals, sulphide clast fragmentals, intense sericitic alteration, vein (pyrrhotite, pyrite, chalcopyrite, quartz) stockwork as well as disseminatioms of lead and zinc. It is now apparent that drillholes HWY16-01 and HWY16-02 did not penetrate the entire hanging wall sequence and will be re-entered and deepened. Partially completed drillhole HWY17-03 has encountered a hanging-wall sequence only seen previously at the Sullivan Mine. In 2016, John Leask and Gordon Leask granted the Company an option to earn an undivided 50% interest in the Monroe property. In order to exercise the option, the Company must make annual optional exploration expenditures totalling $3 million over the next four years. Upon exercise of the option, the Company and the vendors will form a joint venture to further advance the exploration and development of the project, with the vendors holding operatorship. Given the non-arm's length nature of the transaction, the Company received approval from a majority of disinterested shareholders as well as the TSX Venture Exchange.